In the run up to St.Patrick’s Day I always try to cook up some food that reminds me of when I was a kid growing up in Ireland. I like to make Irish food for my daughter so she gets a taste of this part of her heritage. Irish Scones have always been a thing of comfort for me and although they are not exactly the thing you would neccesarily have on St.Patrick’s Day they are none the less very Irish. And who doesn’t love a good scone, pronounced like cone with an S from where I come from by the way and rarely with cream so no agruments about what goes on first! Always butter first then jam. I can’t tell you how much it pains me that I have to ask for butter with my scone every single time here in the UK. Scones need butter. These Irish Scones are made with buttermilk and sultanas and are the scones I grew up with. There are as many variations of Irish scones as there are recipes for soda bread or stew. This is just the recipe I like the most. If you don’t like sultanas then go ahead and leave them out, if you prefer currants then use them. Irish scones are not as big and risen as the English variety they are usually smaller, less sweet and a little flatter, this just means you get to eat more than one 😉 They are perfect for elevenses, breakfast or anytime they take your fancy and are fairly quick and easy to make. Right then, lets get down to the nitty gritty, I use salted butter to make these and yes I also add salt, this gives these scones a little extra saltiness, I like that slightly salty sweet flavour that using more salt brings. Buttermilk gives these scones a little tangy taste but it is essentail for getting your scones to rise, the acidity of the buttermilk works with the bicaronate of soda to give a quick rise. You should be able to get a reasonable buttermilk from your supermarket but you will find a better buttermilk in farm shops. You could make some at home by adding lemon juice to milk but I find this rarely works as well as the real stuff. The less you handle this dough the lighter and flakier your scones will be. So be quick when you are rubbing in the butter. It also helps if you have cold hands, I don’t, I seem to always have warm hands so I run cold water over my hands and pat them dry before I make these. I know this may sound slightly mad but it works and a good scone is worth the pain of icy water over my hands. The egg wash will give your scones a lovely golden colour and an extra sprinkle of sugar gives these scones a little more sweetness and colour. Ideally you should serve these straight from the oven, just cooled a bit, the butter should melt on your scones and so should the jam. These will keep for a day or so in an airtight container but to be honest they rarely last more than a day in my house. I hope you have a very lovely St.Partrick’s day, raise a glass or two and Lá fhéile Pádraig sona dhuit! 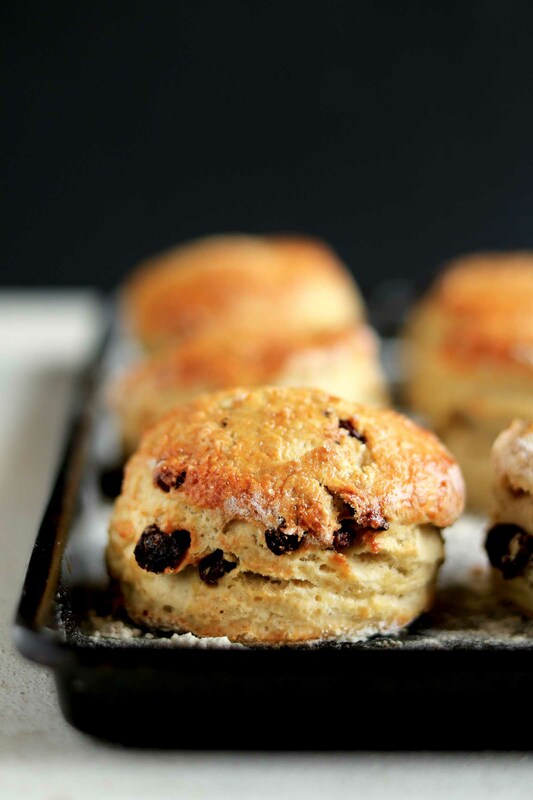 Irish scones, made with buttermilk and sultanas, perfect for St.Patrick's Day or any day! Serve warm with butter and jam and a nice big cup of tea. Preheat the oven 190 degrees C, 374 F.
Sieve the flour, bicarbonate of soda and salt into a large mixing bowl. Quickly rub in the butter with your fingertips, you should have a breadcrumb consistency when all the butter is incorporated. 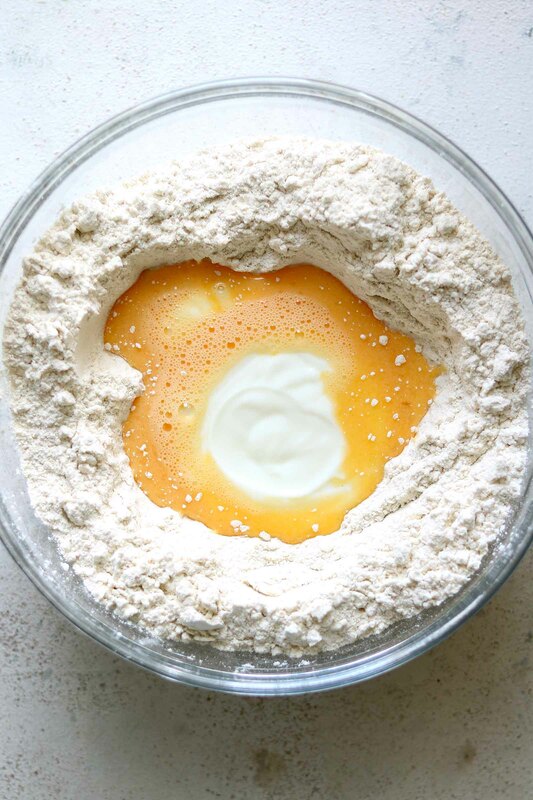 Make a well in the centre of the flour mixture then add one beaten egg and almost all of the buttermilk. Using a pastry knife or a butter knife stir in the wet ingredients until a dough forms. If the dough is still a little dry add in the rest of the buttermilk. Tip the dough onto a floured board and bring it together very quickly, do not over knead it just needs to be a very quick knead. Using a rolling pin shape the dough into a round about 2 1/2 cm or 1 inch thick. I do this by pressing down on trhe dough rather than rolling it out. Using a 6cm / 2 and a 1/2 inch round cutter cut out the scones. You should have at least 12 scones. 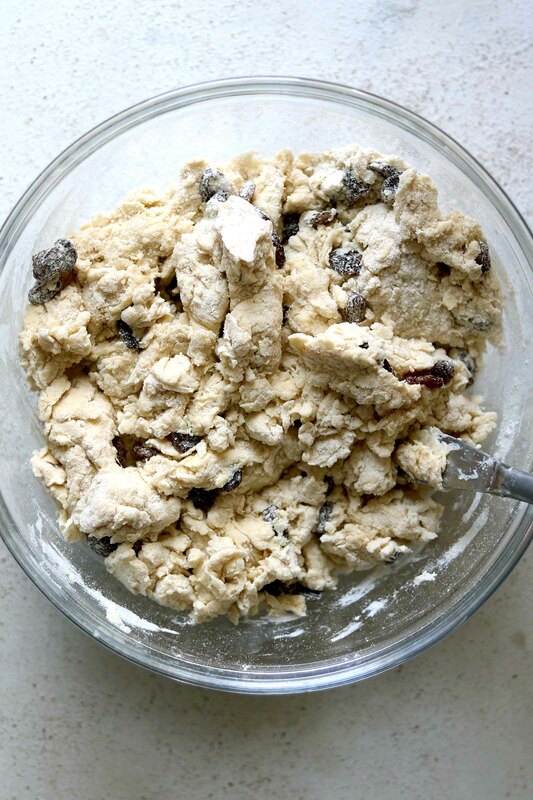 Bring the dough back together to make more scones. Place the scones on a floured baking tray, then brush eash scone with the remaining beaten egg. Sprinkle a little of the granualated sugar over each scone. Place the tray on the middle shelf of the oven and bake for 20 minutes until the scones have risen and are golden brown. Once cooked leave the scones to sit on the tray for a minute or two then transfer to a wire cooling tray. Serve warm or cold with butter and your favourite jam. You can find buttermilk in the dairy section of your supermarket, cultured buttermilk is best and you will find the best buttermilk at farm shops. I used salted full fat butter, unsalted butter works too. Dip your pastry cutter in flour before you push it into the dough, I give the cutter a little then lift them out and place straight on the tray. Remember to be quick rubbing in the butter and to not handle the dough too much. Calories are approximate are per scone and do not include butter and jam. These scones look and sound so good! what a great recipe, and now I know, butter first!!!! I am a bit of a avid cheese scone maker myself ive spent ages trying to perfect them but i dont do sweet ones as often funnily enough i was just looking at a recipie for scones with oat flour and they looked really heavy and hard these i have to say fit my idea of a perfect scone lovely! Can I make them the night before, then bake in the morning? If so, will I just put the unbaked scones in the fridge? Should I let them come to room temperature before baking?